Just how clueless is Hollywood? Very. It’s bad enough that they try to jam crap down our throats all the time, but they also demand that you sit and watch that commercial for “Tide” detergent — all 26 times it runs tonight. You have a moral obligation to watch TV commercials, argues Jamie Kellner, Chairman and CEO of AOL/Time Warner’s Turner Broadcasting division. “Your contract with the network when you get the show is you’re going to watch the spots,” he says. “Otherwise you couldn’t get the show on an ad-supported basis.” He says that people who use VCRs or Personal Video Recorders to record shows and then skip through the commercials during playback are particularly irresponsible. By not watching the commercials “you’re actually stealing the programming,” he says. But what about going to the bathroom during commercials? Is that allowed in the “contract”? Only if you really have to go, he answers: there’s only “a certain amount of tolerance for going to the bathroom.” (San Jose Mercury News) …Good, because so much of their programming makes us want to throw up. The Motion Picture Association of America issued a statement calling the lawsuit “nothing more than a publicity stunt.” They say their dispute is with the companies making digital video recorders, “not individual users.” If that’s the case, why are network execs out there calling individual users thieves? This case isn’t a “publicity stunt,” it’s real people fighting for their rights against — yes — the entertainment oligopolies. The entertainment industry just doesn’t get it. What happened when TV was introduced? The movie industry said it would destroy the movie business. Did that happen? No: it got stronger because of TV. The record industry said the cassette tape would ruin the music business. Did that happen? No: it got stronger because of cassettes. The movie industry said the introduction of the VCR would ruin the movie business. Rather, it created record profits for them. DVDs, same thing. CDs, ditto. But the sky’s falling again — the poor whiners now say that DVRs like ReplayTV and Tivo will destroy them. Can you cry “Wolf!”? The entertainment oligopolies sure are. Previous Post: OK, Pal, Where’s the Fire? Next Post: Let’s Go to Pluto! Quit trying to blow my eardrums out and I may start watching you comercials again. For now I have a mute button. To be honest, I think the DVR has ultimately increased the number of commercials I watch. How so? Well, if I’m skipping through commercials (my DVR jumps 30 seconds at a time forward, and 10 seconds back) and I see something that looks interesting, I’ll jump back 10 or 20 seconds and watch it. Or if anyone else in the family says, “What was that?” I’ll jump back for them to watch it. I watch TV for entertainment, and some commercials are very entertaining. I really think that commercials have become more entertaining for this very reason. There are some commercials I’ll watch every time they come on, and a few I’ve gone off to YouTube to find so I can watch them whenever. At the same time, some of the most entertaining and thought provoking shows can’t make ratings and are cancelled before they even air a few episodes. I should really get rid of my television… I’ve noticed a trend. As TV Networks try to capture ever more viewers, but spread across ever more channels, their shows necessarily have to appeal, less to the mind, and more to the base instincts. If a TV Network wants more than 50% of the population to view their show and enjoy it, they have to build it to be enjoyable to those with below average intelligence based on the simple math of the situation. As TV shows are ‘dumbed down’, and the general population use their mind-muscles less and less, and the average intelligence dwindles, and therefore the new shows must be ‘dumbed down’ even further. Then you end up with shows like ‘Deal Or No Deal’, which is an hour of someone randomly guessing numbers to see if they’ll win money. Complete with lots of ‘scary’ music designed to increase the ‘tense’ moments, and, of course, plenty of attractive females. Most of our prime time TV watching is done through our cable company-provided Cablebox/DVR. And yes, we skip commercials, most anyway. How many times should we have to sit through the same Tide commercial anyway? We get it. Tide. Cleans clothes. Move on. Now here in 2012, we can’t get away from commercials. They are everywhere. Going to the movies, 10-15 minutes of commercials before they run the trailers. I don’t have cable, but watch my shows online. The channels set it up so you have to watch the commercials, you cannot skip past them. So in 2002 the TV execs wanted us to watch more ads, and now in 2012 we have to sit through more ads. I cut my cable/satellite service several years ago. My biggest fear was thinking my kids would revolt and call for my head but they didn’t. Netflix and the instant viewing seems to keep them at bay. As far as watching the shows I like, I go to the networks site and watch them there. ABC for example has several commercials setup to play throughout the show, but what I have found on their site is you can click each “dot or mark” on the progress bar and watch the commercials up front. Once you’ve viewed them all, you can go back to the beginning and simply watch the show without further interruption. I would much rather get through the 5-10 minutes of commercials before I start watching the show. Plus some commercials on the websites are interactive so it gives you something to do while the commercial plays. I hate to break it to the cable providers but the service they offer is on the way out. And am I the only one who has noticed that if you order a sporting event on PPV they are starting to run ads during those as well? I thought the whole point of PPV was not having commercials. I’ve been mulling over dumping DirecTV and buying my entertainments a la carte. This whole Viacom dust-up served to remind me that I’m paying over a hundred dollars a month to watch a half a dozen channels and ignore what, 500? Reminding me of that TW d-bag makes me more conscious that I’m not watching commercials when I watch a show on Netflix or Amazon. I LOATHE TV commercials, with all of their little fake “happy families”, perfect houses each with their white picket fences and pristine gardens, gorgeous labradoodles and 2.5 kids running around the back play “yard”, watched over by Stepford Mom and Stepford Dad with their perfect teeth and perfect hair…perfectly dreadful if you don’t want to get consistently sick to your stomach. And to make matters so much WORSE, 2012 became THE YEAR we began to get “commercials” (aka “ads”) on our SMARTPHONES. Yup: You ask me, they just succeeded in taking all the “smart” right outta those phones. I remember when cable TV promised you “limited” commercials for your subscription fee, since the monthly fee was supposed to cover some of what they “lost” from running fewer ads. Of course, I also remember being wowed by a wired “remote control” with toggle switches to change channels. All 30 or so of them! I pay my cable bill. Obligation fulfilled. I assume he is talking about the commercials that are not planted in the middle of the TV shows (movies etc.) blatantly showing car features etc. as if the writers thought it would be a useful part of the script. Do we get bathroom credit for having to sit through fake commercials in the programming we are supposedly paying for by watching “real” commercials? I too have started to just mute them and have family time (we discuss our day and ignore the tv) — why? Because the tv DEAFENS you during commercials. It is at a decibel level 6 times higher than I had to have the show to hear the dialog on the show I was watching (enough to cause damage to my hearing). And those ads that now come on web sites superloud when I pull up a new website? I shut my speakers off till they are over while I read my article. I have made somewhat of a personal issue about it. If I continue to be deafened by the SAME commercial, I refuse to buy their product. It is my own personal fight back, but like someone else mentioned, if I see the ad enough times in the same show, forget it — I won’t buy it; it was shoved down my throat and I refuse to be pushed into buying it. If you scream it at me, forget it — I won’t buy it. If enough people said it and did it, maybe they would get the hint. 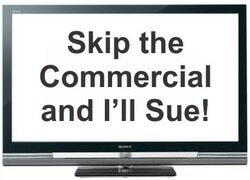 I don’t mind “paying for the right to the show” by watching a “few ads,” but when the ad time is more than the show time and the ads are repetitive and loud, you have ignored my sensibilities, tried to brainwash me and done damage to my hearing. And another comment was also true: shows are dumbed down, but for some of us that isn’t an option. High priced dishes or my free network tv. So we watch more and more on the internet — and tv is losing out entirely. Hello Roku! for most intelligent shows, Netflix for movies, cnn.com or msnbc.com for news (local tv station websites for local news) and none with commercials (that I can’t close out or turn off the sound) and I can PAUSE video to go to the bathroom. We rarely watch true tv anymore due to the commercial issue. Their loss….